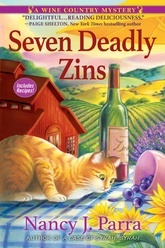 Who is the infidel who drowned an inspector in the Zinfandel? Taylor O’Brian takes small groups on wine country tours of romantic Sonoma County. But vintage turns to vinegar when an FDA inspector is found floating face down in one of her friend Tim Slade’s vats of squished grapes. Tim is arrested for murder, and Taylor and her friends rally to prove his innocence. But the winery proprietor’s acidic sense of humor tends to reap sour grapes. Taylor’s investigation withers on the vine until she discovers that Tim’s girlfriend, Mandy, is having an affair with a self-help guru. But then, Taylor finds Tim standing over the body of the guru. This tart turn of events sends a bottle shock through Sonoma, as the murderer’s scent is obscured by an unsavory bouquet of red herrings. Includes recipes.